The Botha was designed for Coastal Command RAF as a three-seat twin-engined reconnaissance-bomber, able to carry a torpedo internally or up to 907kg of bombs. Defensive armament was a single 7.69mm Vickers machine-gun forward and a dorsal turret with two Lewis guns. The first prototype made its maiden flight on 28 December 1938 and the first production Bothas entered service with No 608 Squadron on 28 June 1940, but remained in first-line service only until November of that year. A handful of operational Bothas also went to No 502 Squadron, but were also withdrawn rapidly. 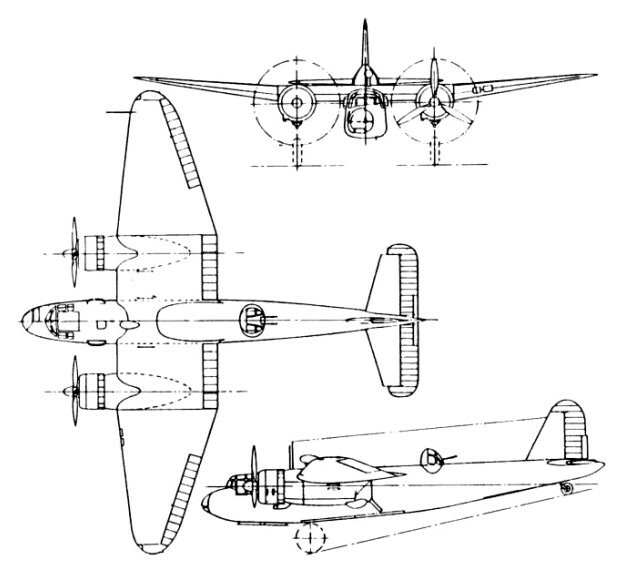 Although the Botha was a failure as a torpedo-bomber - mainly due to being underpowered - large numbers served as pilot, navigation, bombing, gunnery and radio trainers until 1944. Armament: 3x cal.303 MG (7,7mm), 907KG Bomb./Torp./DepthChrg.